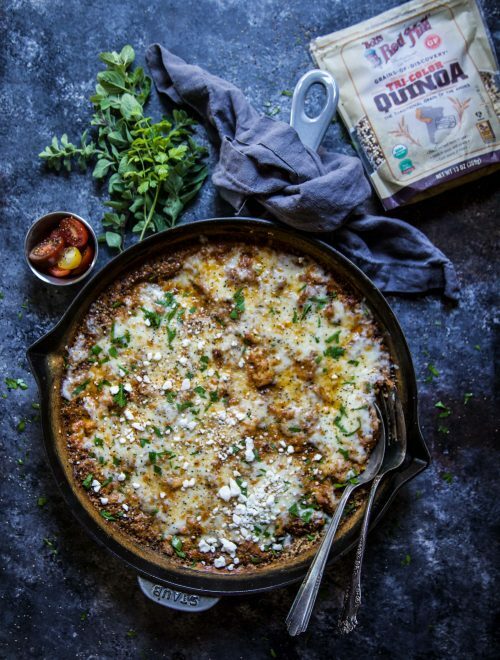 Chicken Shawarma Quinoa Skillet Bake is a scrumptious and cheesy dish that’s easy to make any night of the week! That’s what a weeknight dinner should be about. Do you ever open the fridge, take a peek around and think to yourself, what the heck am I going to make for dinner tonight? Sometimes? Or more like 97% of time? Whenever I open the fridge the last thing I want to do is use a single brain cell to come up with a meal to make. Ya feel me? Which is why I am huge believer in keeping a few staples in my fridge at all times to prevent myself from dialing up take-out. For me, I always have a protein option whether it’s chicken, beef or chickpeas! Fresh vegetables are hit or miss depending on what has survived in the crisper. BUT! My tried and true go-to that always saves the day is Bob’s Red Mill quinoa! 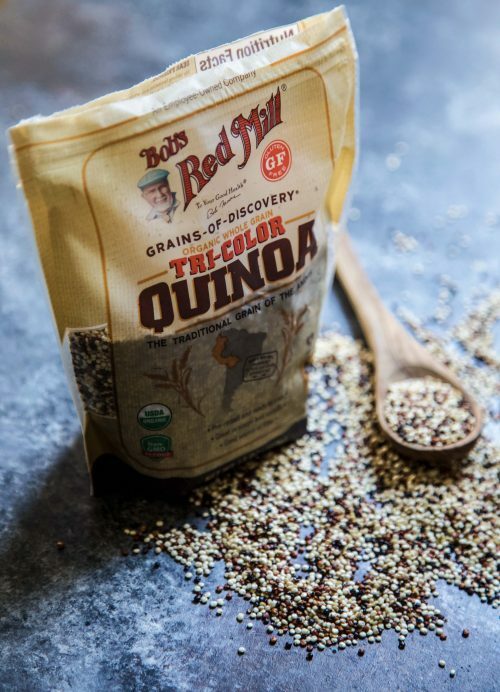 Have you tried Bob’s Red Mill quinoa? If you haven’t let me tell you that you need to get on the bandwagon. Not only is it the prettiest tri-color quinoa (a blend of white, black, and red) on the block, but it’s also 100% whole grain. 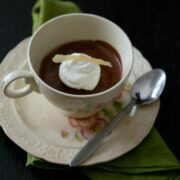 Oh, and super simple to make! 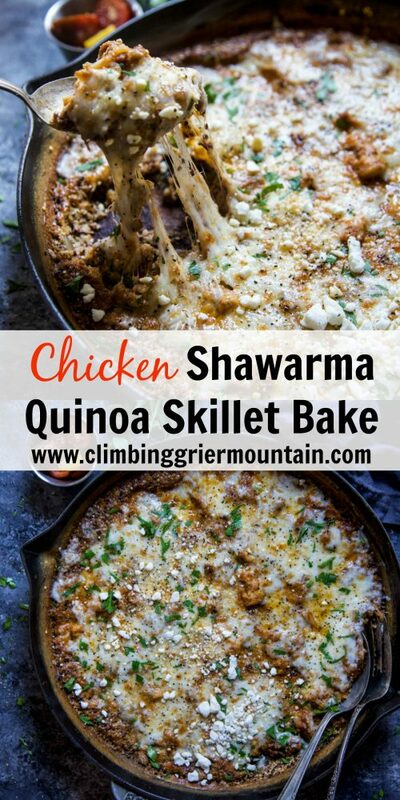 Whip up a big batch ahead of time and use it in salads, overnight breakfast cups, or easy dishes like this Chicken Shawarma Quinoa Skillet Bake. 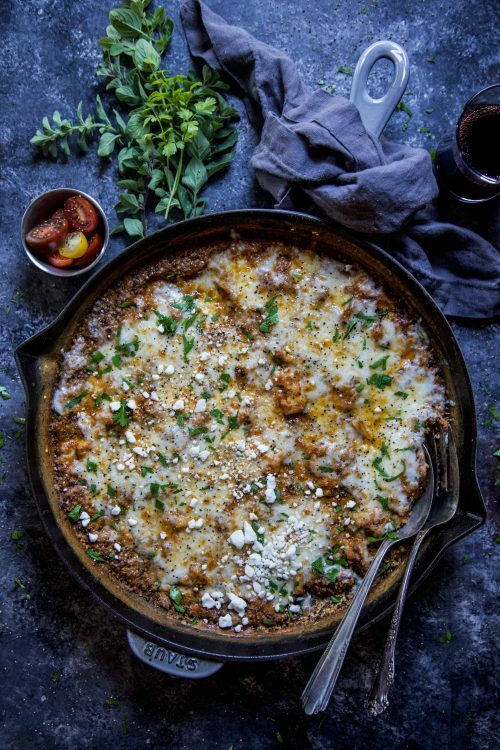 This Chicken Shawarma Quinoa Skillet Bake is brilliant. WHY? Because everything is made in one skillet with a few ingredients. Go ahead, twerk it out for a second. Good? Now, saute the chicken with all the shawarma seasonings, add quinoa, cover and cook. Dinner done in 30 minutes or less. So next time you are starring into the fridge abyss remember that a few ingredients is all that stands between you and a delicious meal. In medium bowl combine chicken thighs, cumin, cardamom, coriander, paprika, garlic powder, salt and pepper. Next, preheat a large skillet to medium-high heat. Add the olive followed by the seasoned chicken. Cook the chicken until cooked through about five minutes. Remove the chicken from the skillet and place on a plate. Set aside. In the same skillet (add more olive oil if needed), cook the onions until tender; about three minutes. Next, sprinkle the flour over the onions. Stir to combine and let the flour cook out for about 30 seconds. Pour in the milk and chicken stock. Continue to whisk making sure there are no lumps. Stir in the quinoa and chicken. Stir again and cover the skillet. Let the mixture simmer for about 15 to 20 minutes or until the quinoa has puffed. Once the quinoa is cooked remove the skillet from the heat. Turn on your broiler. Take the mozzarella and sprinkle it over the top of the chicken. 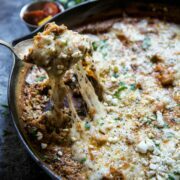 Place the skillet under the broiler and melt the cheese. 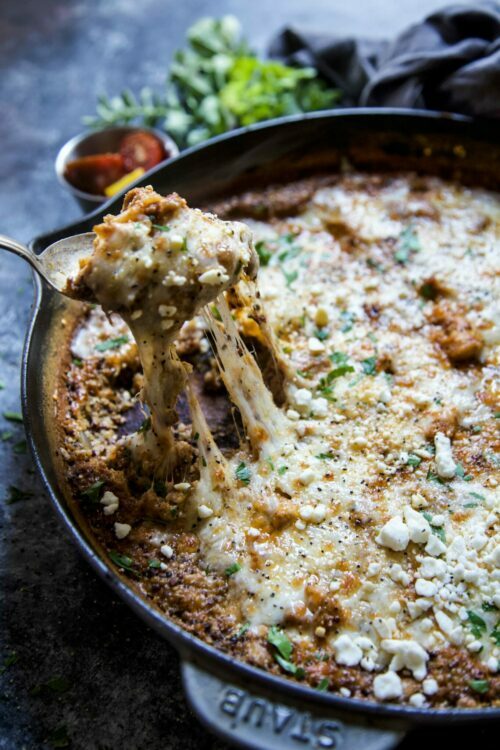 Once the cheese has melted remove it from the broiler and garnish with feta, tomatoes, oregano and parsley. Serve immediately. AND YES… Bob's Red Mill quinoa is kind of the best. 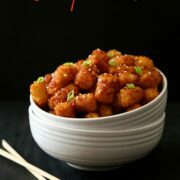 I bet this is so flavorful with all of those seasonings you included! I can’t wait to try this! Yay!! The quinoa really kicks it up a notch! Chicken Shawarma is the BEST! 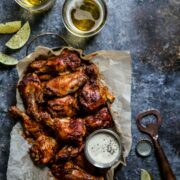 Gone weeknight dinner? SO into this! Omg, that is me every afternoon — I’m always looking into the fridge reaching for pantry staples! 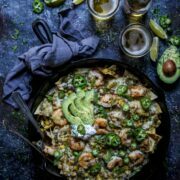 This skillet meal has everything to make everyone in my family happy. Plus, how pretty is that quinoa? This looks extra tasty! I love it! Quinoa is my favorite. 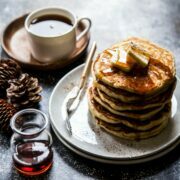 It’s such a delicious recipe!! I made this tonight and it was so delicious! Will definitely make again. The seasonings were perfect.